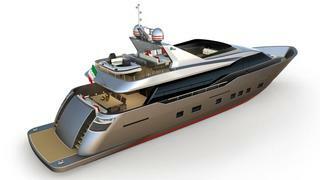 Several items of good news arrive from the Italian shipyard Tecnomar. Firstly, there's the announcement of a new order as the yard has sold a new Nadara 30 to a European client. Entirely designed by the in-house architects and designers, this superyacht will be the widest in the world for her size, with a beam of 7.20m. The Nadara 30 is proposed in two versions. She can accommodate up to 10 guests in four or five cabins, all located on the lower deck including a full-beam master stateroom. On the technical side, she's powered by twin 1,925hp Caterpillar C-32 engines giving a top speed of 27 knots and a cruising speed of 24 knots. This new Nadara 30 will be delivered in Summer 2012. The other news concerns the massive reorganization started since the arrival of Giovanni Costantino as the head of the yard in January 2009. Now completed, Tecnomar proposes a full range of new models : three brands, 19 models, three lines in steel & aluminium, two lines in composite material and a brand new sailing line. Tecnomar, planing yachts in composite material: Nadara 45, 38, 30, 30 RPH and Velvet 42, 36, 30. Tecnomar Alloy 5083, planing and displacement vessels in steel & aluminium alloy: Regale 42, 42 HT, 37, 33; Maxima 45, 37; Impero 56, 45, 37. Tecnosail, sailing vessels in composite material or alloy: Silent 100, 76, 66 ft.
2011 has begun very well for the Italian yard, as evidenced by Francesco Carbone, Tecnomar Sales Director: "One Tecnomar yacht has already been delivered in the Middle East in 2011 and there are several negotiations ongoing."